The most powerful earthquakes are the Megathrust Earthquakes that occur at the subduction zones. Here we see one tectonic plate is pushed below the other. On the other hand, there is the slow slip events (SSEs) which release seismic stress at a much lower rate as compared with the large earthquakes. These occur in a cyclical manner across months to years. These SSEs can occur along the megathrust or any other areas which experience weakness due to loading. As a result, there can be release of low frequency seismic waves. How the fluid which drainsfrom the SSEs can influenceseismic activity has been a topic of research for scientists fromthe Tokyo Institute of Technology and Tohoku University. It is known that when megathrust earthquakes occur, the megathrusts open up. The fluid that drains out from the megathrusts is due to deformation. Not much is known whether the fluid movements that occur is due to the SSEs or not. According to professor Junichi Nakajima at Tokyo Institute of Technology and associate professor Naoki Uchida at Tohoku University, the megathrust seismic activity can also be due to the fluid draining from the slow slip. In order to find whether there is a relationship between SSEs and seismic activities, they have conducted various studies with regard to the seismic activities that occur around the Philippine Sea Plate. They found that the boundary of the plate is where the earthquakes occurred time and again. They also found a relationship between seismic activity and estimated slip-rates. From this they concluded that the seismic activity that was seen above the megathrust of the Philippine Sea Plate kept changing according to the episodic cycles of the SSEs. There was a great amount of draining during the SSEs which occurred every year together with fluid draining into the overlying plate. The researchers have studied waveform data from beneath Kanto, Japan from 2004 to 2015. Their analysis has been published in Nature Geoscience. They have explained the role of pore-fluid pressure. The areas of slow slip have high pore-fluid pressure and hence are able to release the fluid into the other areas of the rock. 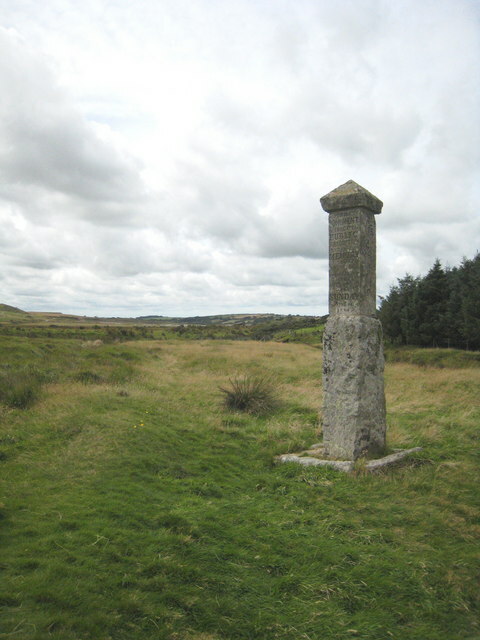 The SSEs could cause the fluid to flow into the overlying rock areas if there was a fracture or a space in the rock bodies. This in turn will cause weakness in those areas resulting in earthquakes. On the other hand, if there were no fractures or open spaces on the overlying plate, then it would not be possible for the fluid to move into it. The fluid would then be forced on to the megathrust area. This could eventually trigger megathrust earthquakes. From this they inferred that the slow slip could be a catalyst in triggering megathrust earthquakes. Though stress modulation is a major contributory factor for the megathrust earthquakes, the fluid that flows due to the episodic SSE may also play an important role than what was believed earlier. 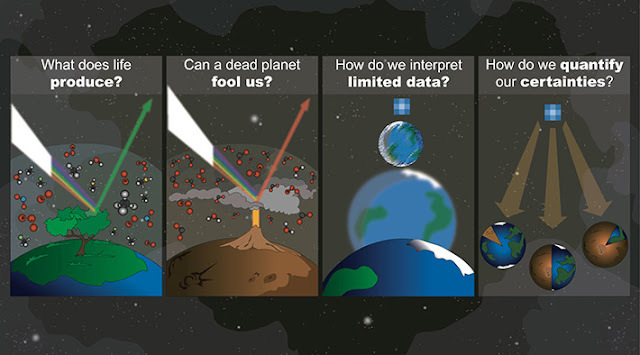 The search for life on planets other than our own has been a long and continuing one. At first planets within our own solar system have been checked to see if they had life beyond earth or could in fact support life. Since then scientists have trained their sights on planets that revolve around stars other than our very own sun. Such planets are called exoplanets and with the developments in technology, scientists have found new methods and technologies that could help them detect life beyond earth. Researchers around the globe have now given a roadmap to discovering life beyond earth which is documented in 5 papers published in a journal called Astrobiology. The papers detail how scientists can look for life beyond earth using telescopes. The first exoplanet was found years ago in 1992 and since then the pace of discovering more exoplanets has increased drastically. At present at least 3,500 exoplanets have been discovered since the first in 1992. Therefore steps were required to see if these planets and others like it could support life or maybe even have life beyond earth. Scientists around the world have been called in to share their knowledge and combine resources to aid in the search for life beyond earth. NASA’s Nexus for Exoplanet System Science (NExSS) has done just that. The international network started three years ago, has got scientists from various disciplines to establish signs of life beyond earth as well as look for life on these exoplanets. The work of NASA’s network is an ongoing effort of scientists and at present has resulted in papers detailing the past, present and future on how to look for life beyond earth. The papers are the work of scientists for over two years and consist of the work of scientists form various fields including astrophysics, biology, chemistry, heliophysics, planetary science and earth science. These papers formed what is contained in the astrobiology journal. What does the astrobiology papers detail? Besides detailing how to look for life beyond earth, these papers contain details of issues faced and how scientists are working to resolve them or have already resolved them. Apart from this, the papers also contain details of two major signals that scientists look for when searching for life beyond earth. One has to do with looking for gases being produced on the exoplanet, such as oxygen, made either by plants or microbes. The second signal has to do with looking for the light reflected off of living beings for example the color of leaves. Researchers are also setting up signals to identify when an exoplanet actually has got life but shows no signs of it and vice versa. There may be cases where oxygen maybe produced without the existence of life or there maybe cases where life exists on an exoplanet but without any biosignatures being given off from that planet. An ancient meteorite that was formed 4.5 billion years ago could be the key to understanding the origin of life on earth. This ancient meteorite was formed during the birth of the Solar System. At that time, the ancient meteorite landed on the earth and scientists found that it contained the basic building blocks of life. The isotope analysis conducted on this ancient meteorite showed the presence of oxygen, nitrogen, carbon and hydrogen.The scientists are of the opinion that this new discovery could reveal the origin of life on earth. The findings could also help the researchers to understand if there is a possibility of life existing in other Solar Systems as well. The birth of the Solar System was quite tumultuous with space rocks that were present around the Sun’s gravitational field colliding with each other at a rapid rate. They formed planets, moons and meteors that are present today. It is one of these ancient meteorites which was formed around 4.5 billion years ago that has been analysed by the scientists. 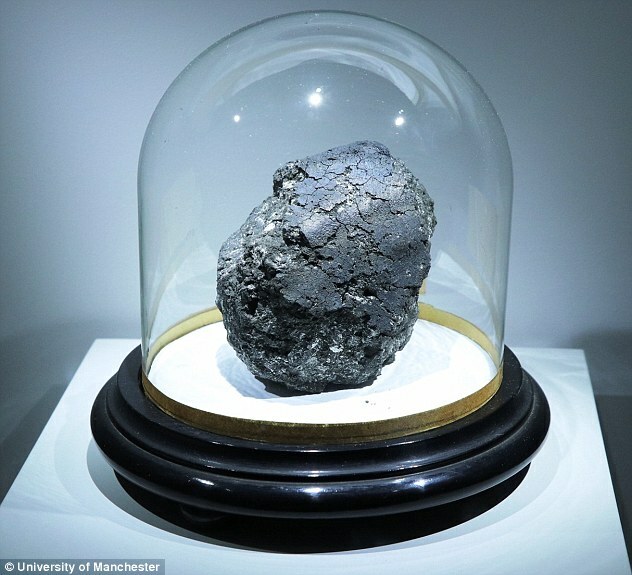 The scientists at the University of Manchester carried out studies on this ancient meteorite which is quite rare known as carbonaceous chondrite. They make up only a few per cent of all known meteorites. They are very important when it comes to understanding the beginning of the Solar System, since the earth tends to wipe off such records. It is a grapefruit-sized space rock known as Orgueil and showed the presence of the basic building blocks for life. The ancient meteorite and other rocks are made of solid materials like rocks, water, ice and fine grain dust that formed in our Solar System. This ancient meteorite and other rocks that are found on the earth help the scientists to analyse how planets are formed and how they evolve over billions of years. The scientists conducted isotopic analysis of the compounds within this ancient meteorite. They found the key elements like oxygen, carbon, hydrogen, nitrogen and sulphur which are the building blocks of life. Isotopes are different versions of the same element having same number of neutrons and varying number of protons in the nucleus. All the research conducted by the scientists have been published in PNAS. Their research confirms that the organic materials were formed due to the chemical reactions that took place during the birth of our Solar System. The scientists headed by researchers at the University of Manchester are of the opinion that if such organic materials could be formed by simple processes in the early Solar System, then it could be an indicator that life forms could exist in other planetary systems. Besides helping us understand our own Solar System, we could also know if there is a possibility of the existence of life in other solar systems. The ancient meteorite was scrutinised by the scientists for over two years in order to discover the exact components. The presence of oxygen may show that the key elements were formed by themselves in our Solar System and not come from elsewhere. The oxygen isotope pattern was same as that which linked the composition of the sun, asteroids and planets. This indicates that the ancient meteorite was formed due to the chemical reactions that took place in the early Solar System and not inherited from elsewhere. According to researchers, there is an evidence of water on Mars. They have got proof of a body of liquid water on Mars. They are of the opinion that there is a lake present under the south polar ice region of Mars, which is about 20km (12 miles) across. Earlier studies showed signs of intermittent liquid water on Mars. Nasa’s Curiosity Rover showed that lake beds were present on the surface of Mars in the past. As of now there are signs of persistent water on Mars. Due to the thin atmosphere on Mars, the climate has cooled and most of its water has turned into ice. The discovery of water on Mars was made by using Mars is, a radar instrument on board the European Space Agency’s Mars Express orbiter. The lake, which may not be very large is near the south pole of the planet. Based on their findings, the researchers are quite excited about the evidence of water on Mars. This opens wide the doors of a possibility of life forms existing on Mars. The study was led by Prof Roberto Orosei from the Italian National Institute for Astrophysics. 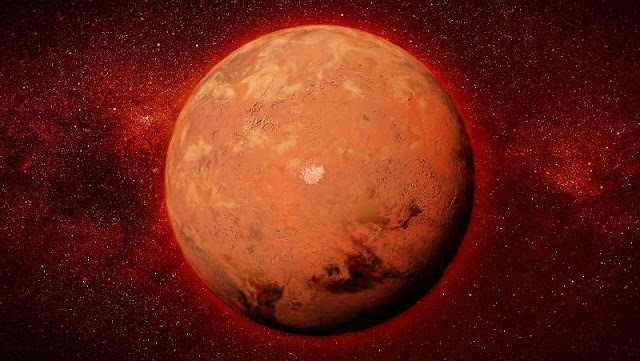 Although the thickness of the layer of water could not be determined by Mars is, the researchers are of the opinion that it is a minimum of one metre. Mars is is a radar instrument which examines the surface and the next subsurface layer of the planet. It sends signals to the layers and whatever information bounces back is then examined. There is a continuous white line at the top of the radar. This area is the beginning of the South Polar Layered Deposit, which is an accumulation of water ice and dust. Under this layer the researchers have come across something unusual about 1.5km below the ice. There is a light blue reflection from the bottom which is higher than that of the surface. This could be an indication of the presence of water on Mars. What does the presence of Water on Mars mean in terms of existence of life? Dr Manish Patel from the Open University says that it is a known fact that life does not exist on the surface as it is inhabitable. The possibility of life existing on Mars will then have to be in the subsurface. This layer is basically protected from the harmful effects of radiation and we also see favourable levels of temperature and pressure. These conditions allow liquid water which is essential for life to exist. Though the research suggests the evidence of water on Mars, it is not possible to confirm the existence of life on the planet. The temperature and chemistry of the water on Mars could be a problem for any kind of living organisms. The cold conditions are anywhere between -10 and -30 degrees Celsius and for the water to be in its liquid state, it should have many salts dissolved in it. There is a possibility that the water on Mars could be very cold and concentrated with salt, which will be definitely challenging for life to exist.